The biggest area I see where the vast majority of salmon anglers could improve there salmon 'hit' rate is through fly control. Get your brain fully tuned into your salmon fly to a point where you can sense its movement in the stream before it gets close enough to see it and bin any useless thoughts of what's going on above the waterline! If you want consistent success in this intriguing business focus on your salmon fly and get its movement pace 'across' and 'down' the river just right. All salmon are smart & tough to catch on a fly so unless your presentation is up to scratch you're heading for an inevitable blank! Out smarting salmon should become an obsession and placing that fly in their 'attack zone' is a truly fascinating element of this fine pursuit. Sometimes the salmon holding area in the water column may be high but more often than not you'll need to swim your fly right down in amongst them for one to lose the plot! Study the 'suspected' sub surface salmon pool terrain and let the surface movement of the river be your 'mirror' for signs of what lies below. The two most important areas of your fly's flight path are the first third and last third of its swing. The middle third normally takes care of itself as the stream will naturally add control to the fly by the time your line has swung round one third from its initial delivery angle. 'Taking command' of your fly early at the start of the first third of the swing is important as most anglers mend their line angle too late or are unable to mend to the fly at all with their shooting heads at range even though they've impressed the hell out of themselves with the distance they've achieved! A longer Speyline and Spey rod has a massive advantage for making that first third of the swing 'deadly' when covering long range salmon that require a normal paced & carefully 'controlled' salmon fly. When you think your salmon fly is reaching the end of the final third of its swing be very cautious and stop yourself from thinking only about the 'relaunch' process! Treat every swing of the fly with suspicion and as if a big brute of a fish is 'shadowing' your fly as it finally swings in downstream of you. 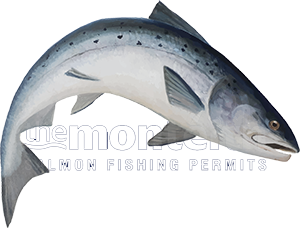 Salmon are great at 'silently & invisibly' coming for a look so maintain movement in your fly by carefully drawing in line smoothly & consistency as you're hand lining in your running line. If you just whip the running line in too quickly or let the fly sag you may well be missing great hooking opportunities from fish that are following your fly. If a tiny camera was able to be fitted to your salmon fly your heart would be in your mouth on numerous occasions throughout the course of a fishing day so it's important while salmon fishing you pay attention to what you're seeing and also to what you may not be seeing!